Austrian GP 2017 Odds: Lance Stroll To Repeat On Podium? The Formula One world is still coming to terms with the amazing performance of it's youngest driver, Lance Stroll. The Canadian is barely old enough to have a regular driver's license in his home country, yet his podium finish at the recent Azerbaijan Grand Prix saw him become the second-youngest driver in history to finish in the top three. It's a record that has the whole racing community excited and it could have been even better if Max Verstappen hadn't made his first podium appearance when he was eleven days younger. So does Stroll actually have a chance of repeating the feat? Bookmakers have him as high as eighth on the list of favourites for the upcoming Austrian GP, which is certainly his highest position in his short career. I'm certainly not backing a repeat podium appearance, but I was also proved wrong when Lance finished the last race in third position so anything is possible! The Azerbaijan GP saw both Lewis Hamilton and Sebastian Vettel miss out on the podium - it's the only time this season that neither of the top-ranked pairings reached the top three. Daniel Ricciardo was the beneficiary on this occassion, winning his fifth career F1 race and reaching the podium for the 22nd time. His season so far has been impressive with no finishes outside the top five, although he has been retired twice which has proven very costly on the drivers championship standings. Ricciardo's price leading into this race is very tempting. He has shown that he is capable of mixing it with the world's best throughout this F1 season and outperformed his highly-rated young teammate Verstappen. The Australian is definitely one to consider for back-to-back podium finishes and my money would be on him to achieve this. Hamilton, not for the first time, starts this race as the clear favourite. While he has won the same number of races in 2017 as his great rival Sebastian Vettel, his performances in races he does not win are costing him in the drivers championship. A fourth, fifth and seventh place finish alongside his two seconds and three wins have dented his title aspirations and the consistency of the world's best driver is something that needs to be addressed. There are two ways to look at Lewis Hamilton when considering his chances of winning the 2017 Austrian GP. On one hand you could say that his lack of penetration in the last two races is a worrying trend. On the other hand, he is too good a driver to miss the podium for a third consecutive occasion and is certainly due for a win. He dominated most of the Canadian GP and had car trouble in Azerbaijan. Hamilton's technical ability is class, and on a track where technical drivers normally excel, I'm backing him to pick up a much needed victory. 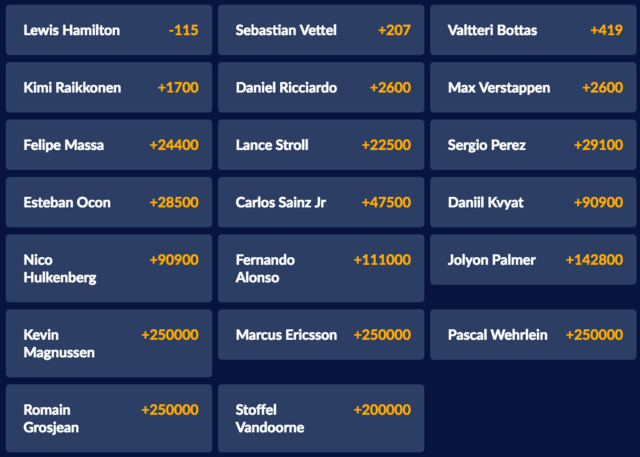 Sebastian Vettel is once again priced as Hamilton's nearest rival, and he too has gone off the boil slightly with back to back fourth-place finishes in Canada and Azerbaijan. The same arguments apply to Vettel - he is also far too good a driver with far too good a car to miss out on a third consecutive podium. Yet the Austrian GP has not been a happy hunting ground for the four-time Formula One Championship winner - he has been retired twice in the last three seasons at the Red Bull Ring. Failure to finish the race would be absolutely disastrous for Vettel, so it is not unfathomable that he would drive slightly more conservatively in this race. This is worth considering when looking at his price which I believe is far too short, even if he is the current championship leader. Steer clear of Vettel winning this race (pardon the pun). The back-to-back 'failures' of Hamilton and Vettel have left the door open for other drivers to make up ground in the drivers championship, and it is an invitation that Finnish driver Valtteri Bottas has jumped upon. The 2017 Russian GP winner has shown he is capable of winning races and back-to-back second place finished sees him as the only other driver to have passed 100 points this season. He is third on the list above and reasonably short, but this is a great outsider bet! Will Lance Stroll Double up On the Podium? This is the question on everyone's lips, particularly those in Canada who have not seen a home-grown podium finisher since the days of the great Jacques Villeneuve. The result proves that anything is possible in the Formula One world and also showcases the immense talent that Stroll possesses, which should hopefully silence the critics who suggest that he is only in the sport because of his billionaire father. I can't see a repeat though for one big reason. The Austrian track is known for its pace and Stroll simply does not drive a car that is competitive in this type of environment. Unless a series of unfortunate events knock out the Mercedes and Ferrari drivers, do not expect to see Lance Stroll on the Austrian podium. With that being said, it is not a bad idea to back him to finish in the top six. Again, this is reasonably unlikely although his recent performances should have him full of confidence and if he can secure a decent starting position on the grid, anything is possible. Perhaps hold off until the end of qualifying to determine whether or not Stroll has a genuine chance of a decent finish. The Austrian GP promises to throw up a number of surprises as always, and it is definitely worth a bet. As per the above, Lewis Hamilton's technical ability is certainly the key factor in his race favouritism and he will be hard to dislodge. He has been unlucky to not finish on the podium in his last two attempts and should make up some ground on Vettel by winning this race. If the price of the champion driver is too short for your liking, my advice is to try one of the following bets. Look for the combination lines, specifically the 'race win and fastest lap' combo as this will offer much better value and there is always a great chance that the race winner will record the fastest time during the race. Alternatively, look at podium finish bets for those just outside the top five favourites listed above. Whatever you choose to bet on, don't forget that you can connect with other F1 fans on our Facebook page. Chat about race information, betting tips and who you believe will finish atop the podium on Sunday. Catch all the action starting with the practice rounds on Friday July 7th, and don't miss the big race!